Self-catering Gîte with 6 bedrooms and 5 bathrooms. Sleeps 10. Non-applicable changeover. Self-catering Chalet with 3 bedrooms and 3 bathrooms. Sleeps 8. Saturday changeover. Self-catering Chalet with 5 bedrooms and 5 bathrooms. Sleeps 12. Saturday changeover. Self-catering Chalet with 3 bedrooms and 1 bathrooms. Sleeps 8. Saturday changeover. Savoie is an alpine paradise renowned for its wild beauty, clear mountain air and some of the best alpine skiing in the whole of France. This area is home to Mont Blanc and there are numerous ski resorts within a short driving distance of the airport at Chambery, the region’s capital. Les Trois Vallées in Savoie is one of the largest connected skiing areas in the world, suitable for both skiers and snowboarders, with breathtaking scenery and wide open spaces. The world-famous Val’d’Isere ski region is also here. The villages of Val-d'Isère and Tignes form a linked ski area called L'Espace Killy, named after an Olympic skier, and known as the ‘Most Beautiful Ski Area in the World’. The superb facilities include 300km of ski slopes, cross country ski trails, and excellent snowparks for snowboarders. 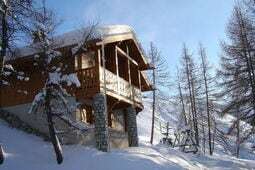 Also nearby is the equally well equipped but more affordable ski resort of Sainte Foy. Savoie is also a great year-round destination for walking, cycling and boating. Its two main lakes are the very clean Lac d'Aiguebelette and Lac du Bourget, which is the largest and deepest lake in France. The cuisine of the Savoie is dominated by dairy products from lush pastures, fish from the lakes and mountain streams, game from the forests and mushrooms from the woods. Orchards are planted with cherry, apple, pear and walnut trees, and strawberries and raspberries are plentiful in the glades. The rivers provide resources for a number of Savoyard dishes including fricassee of frogs legs with garlic, onions and vinegar, perch with red wine and quenelles. The wines of the Savoy are all unmistakably mountain wines and have a long history. Until recently they were rarely found outside the region, but their quality and reputation have recently been experiencing a quiet transformation. See our latest selection of Savoie holiday rentals.